Home » About Us » Our Physicians » Todd C. Ryan, D.O. After earning a B.S. 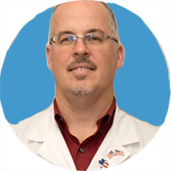 degree from the University of Scranton in Pennsylvania, Dr. Todd Ryan attended the New York College of Osteopathic Medicine at The New York Institute of Technology. Dr. Ryan completed an Osteopathic Rotating Internship, as well as a preliminary General Surgery year before completing his four year Orthopaedic Residency at Peninsula Hospital Consortium in Queens, New York. His subspecialty training was completed during a Sports Medicine Fellowship at the Florida Orthopaedic Institute in Tampa. While in Florida, Dr. Ryan participated in the care of the University of South Florida athletes as well as the Tampa Bay Storm Arena Football Team and was an Outback Bowl Field Physician in 2002. Dr. Ryan has been practicing Sports Medicine and General Orthopaedics for all ages since 2002. As the Orthopaedic Physician for Bishop Ahr High School in Edison, NJ, Dr. Ryan was inducted into the school’s athletic hall of fame. In addition to general orthopaedics, Dr. Ryan specializes in the treatment of sports injuries of the shoulder, knee, hip, ankle, and elbow. Dr. Ryan is fellowship trained in arthroscopic surgery, ligament reconstruction, rotator cuff repair, labral repair and cartilage restoration. He is also skilled in Hip Replacement, Hip Arthroscopy, Hip Resurfacing, Unicondylar Knee Replacement, Synthetic Cartilage and PRP injections. Dr. Ryan is a member of the New Jersey Orthopaedic Society, The American College of Osteopathic Surgeons, The American Osteopathic Association and The American Osteopathic Academy of Orthopaedics. Dr. Ryan values educating his patients. He believes that when a patient understands their medical condition and knows their treatment options, they are better able to actively participate in their own medical care and recovery.